2010 Snowmageddon explained, sans global warming/climate change | Watts Up With That? The 2010 Snowmageddon event was quickly seized upon in an NYT op-ed by global warming zealot Al Gore as yet more proof of…climate…warming…mumble.. something. Yet in this NASA article highlighting a new peer reviewed paper, global warming/climate change isn’t even mentioned. Hmmm, who to trust? 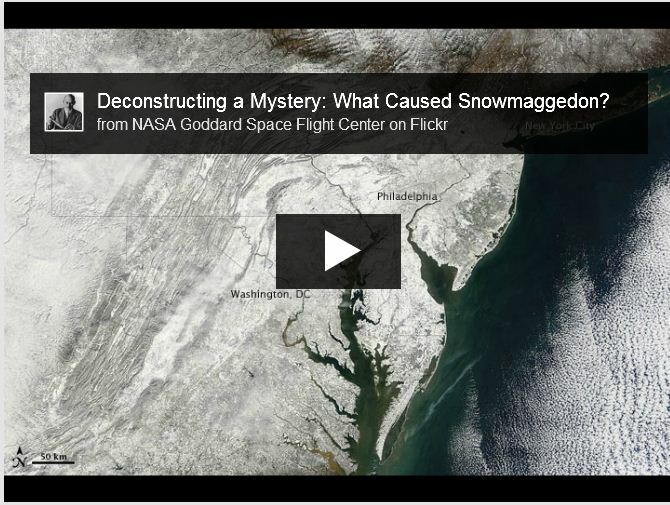 From NASA: Deconstructing a Mystery: What Caused Snowmaggedon? Two years later, scientists are still searching to identify the unique set of conditions that enabled storms of this magnitude to occur. 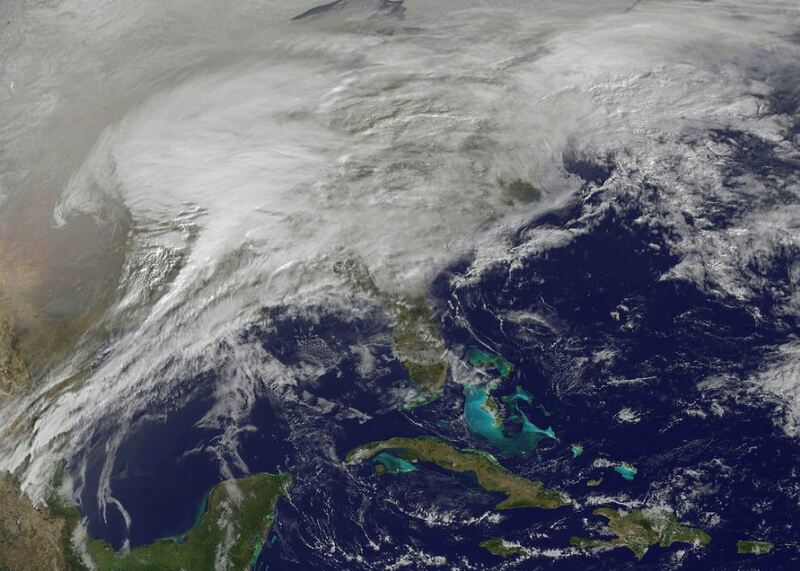 To determine a direct cause to infrequent but major winter storms, Siegfried Schubert and colleagues Yehui Chang and Max Suarez – all of NASA’s Goddard Space Flight Center in Greenbelt, Md., – became detectives. “El Niño is predictable on monthly and seasonal time scales. But we know that sea surface temperatures don’t control everything about the atmosphere,” Schubert said. “Storms develop in the atmosphere whenever they decide to as a result of instabilities. Models can’t replicate the actual sequence of events in predictions extending beyond a few weeks, but they can predict whether or not there will be more or fewer storms, because of the sea surface temperatures.” Schubert and his team ran 50 different simulations, slightly changing the atmospheric conditions each time while keeping the actual sea surface temperatures the same. In the end, the data showed that the storms were influenced more by the sea surface temperatures, and less by the changing atmospheric conditions. “The atmosphere is chaotic, but if we do this over and over again, slightly changing the initial conditions, we can average the runs, filter out all the random atmosphere variability and see the part that’s driven by sea surface temperatures,” Schubert said. “It’s a structure that tends to favor cold temperatures on the East Coast when it’s in the negative phase,” said Schubert. While the atmospheric pressure fields oscillate at daily and weekly time scales, the winter of 2009-10 saw the North Atlantic Oscillation in a strong extended-negative phase. Combine the resulting influx of Arctic air for an unusually long period of time with the moisture and storminess from El Niño, and the once fuzzy cause of these monster storms starts to come into focus. The research shows that the extreme weather over the Eastern U.S. in the winter of 2009-10 was part of a response mainly to El Niño and its associated Pacific Ocean sea surface temperatures. “People have done these historical studies before to come up with measures, and if you look at the record of major snow storms, some have occurred during El Niño winters and a negative North Atlantic Oscillation phase,” Schubert said. “But sea surface temperatures impacting storminess in the different ocean basins has never been quantified and it’s never been clear what is a relative contribution and in what way they are contributing,” he added. “This model not only confirms that a negative North Atlantic Oscillation and El Niño conditions created the conditions that allowed these storms to form,” said Seager, who did not work with Schubert on this research. “But it is useful in showing how the atmosphere can act differently when combining El Niño with different sea surface temperatures. These models provide controlled conditions, which allow us to be sure about the exact causes,” Seager added. Scientists have predicted that current La Niña conditions and below-average sea surface temperatures might be the cause for the mild 2012 winter on the Eastern U.S. Examples like this, Schubert said, is why it is important to better understand the relationship between sea surface temperatures and storminess. “People want to know whether it’s going to be a snowy winter. Snow prediction is developing but if we predict El Niño, we know it will be more likely stormier. Now whether those storms will be rain or snow depends on the North Atlantic oscillation, which is a big challenge for us because of its constant oscillations.” Schubert and his team’s extended findings on the role of sea surface temperatures in Snowmaggedon will be published in the Journal of Climate this spring. Btw annoying how the well founded climate bandwagon in it’s (unnecessary) appearance always uses the weather, which has nothing to do with climate. The NYT’s is ever eager to print speculative articles and opinion pieces when they’re supportive of CAGW, but loathe to publish actual facts when they are not. I wrote several letters to the Public Editor asking why it was ok to publish a front page piece that did everything but definitively blame the Russian heat wave of that year on global warming, but to make no mention of the peer reviewed paper that came out some months later showing that it was caused by nothing more than natural variation. Of course I got no reply. I was hoping they’d tell me something that wasn’t already obvious. El-ninos are stormier, negative AO/NAO=more cold, resulting in more snow. Gee who knew? I hope they didn’t spend too much money on this study!! I’m pretty sure I remember reading all of this here back in 2010. They really needed to model it to come to the same conclusions? While El Niño tends to produce greater storminess, it does not necessarily lead to more snowstorms along the East Coast. ……Without colder temperatures, these storms bring just rain. Schubert is a meteorologist and senior research scientist for Goddard’s Global Modeling and Assimilation Office (GMAO). Assimilation Office? Has NASA joined forces with the Borg? More “models = reality” overconclusion. Schubert and his team ran 50 different simulations, slightly changing the atmospheric conditions each time while keeping the actual sea surface temperatures the same. In the end, the data showed that the storms were influenced more by the sea surface temperatures, and less by the changing atmospheric conditions. In the end the data showed? The data? No. The data are what go into the models. What comes out are not data. They are model results. Educated (perhaps) guesses about what happened – guesses that might later be confirmed with data. Not data. “This model not only confirms that a negative North Atlantic Oscillation and El Niño conditions created the conditions that allowed these storms to form,” said Seager, who did not work with Schubert on this research. A model confirms? What does it confirm, exactly? The understanding and assumptions bult into the model? If these guys want to study vortexes, they should cast an eye at their own high speed circular reasoning. “But it is useful in showing how the atmosphere can act differently when combining El Niño with different sea surface temperatures. These models provide controlled conditions, which allow us to be sure about the exact causes,” Seager added. I always cringe when I read quotes like this from scientists. Chicago’s Lake Shore Drive, entirely crippled from a combination of heavy snow mixed with Lake Michigan spray generated by high waves crashing into the shoreline limestone barrier during 60 to 70 MPH winds…. And what caused the snowmageddon in Japan recently? And in answer to Leif Svaggard’s comments that recent low sunspot numbers and long sunspot cycles have not caused any cooling, I would beg to differ. In N Europe we have now had three bitterly cold winters, and three disappointing summers. In my 45 years of noting winter weather, I have seen nothing remotely like it (I just missed the ’63 winter). If I were a Charles Dickens-style author, I would be placing my characters in snowbound streets and ice covered canals, and writing about a Little Ice Age. And anyone claiming otherwise, like a climatologist saying that the last three years were the warmest on record, would be laughed out of polite society, especially as the Rhine is frozen over for the first time in nearly 50 years. What a European farmer, industrialist, transport manager, airport manager or, indeed, barge captain on the Rhine wants to know, is WHAT WEATHER CAN I EXPECT OVER THE NEXT FEW YEARS. For climatologists at the Met Office to claim that it will be 6 degrees warmer, based upon a few hotspots in the tropics or the Antarctic Penninsular is not only irellevant cant, it is positively dangerous. People are stuck at airports and on motorways, people cannot get to work, food is not being delivered, and hundreds of people are dying all over eastern Europe, because everyone was promised warmer temperatures, and no planning was made for colder waether. And still we are being told that these are indeed the warmest years on record ! These climatologists are not only dangerous, they have blood on their hands. Why even bother to analyze with only part of the data. It’s been known since at least 1967 that space weather has a direct correlation with Earth weather, and yet you totally ignored the multiple M-scale Solar flares of Feb 6th-8th, 2010 when interpreting your results. Central and Eastern Europe, extreme Northern Africa,and a goodly portion of Asia, are having their version this year. Ocean surface temperatures affect the surface air pressure distribution from the bottom up via the width of the tropical air masses. Solar variability affects the surface air pressure distribution from the top down via the intensity of the polar vortices. Chaotic variability within the climate system then acts upon the net effect from those top down and bottom up influences. At any given time the outturn is somewhat of a lottery. Still no end in sight in the Balkans. Daily minimums are around -20 to -25 °C (and even colder in some places – down to -32 °C) and maximums are around -10 °C. Forecast for the weekend is even more snow! It’s brutal. Most rivers are completely frozen. Electricity generation and distribution is seriously endangered. Some areas already have no el. power and many people use el. power for heating. The whole power system is on the edge of collapse. They can’t get enough coal to the power stations and hydro stations are at very low levels. The Borg yeah , Hansen must have been assimilated early on. What NASA needs is to get back to their main business and leave the political stuff to others.We can’t even get to the space station anymore but we sure can bail out banks and print money. If they need to forecast the weather, I suggest they hire Joe Bastardi-he’s the only one who seems to know how to do it. …AND on Jan 13th 2010 Asteroid AL30 2010 entered the Earth-Moon System and pierced the invisible “solar Veil “. Sunspots => Solar Flares (charged particles) => Magnetic Field Shift => Shifting Ocean and Jet Stream Currents => Extreme Weather [including earthquakes, volcanoes, hurricanes or other extreme natural events] And then there’s usually a near Earth asteroid in place which pierces the solar veil and starts/escalates the cascading series of events. Somebody prove me wrong. Usually weather moves. When it doesn’t move, we get floods and major snowstorms on one side, and droughts on the other. When do I get my million dollars for this “model”? Never. I’m a meteorologist and I read the article with interest since I’m always interested in seeing if we can predict mega snowstorms far out in the future. It’s not earth-shattering that El Nino combined with a negative NOA phase, especially a persistent one, would combined to create snow at times. Sea surface temperature is a good “atmospheric memory” (i.e., colder persistent conditions would eventually lead to below average sea surface temperatures). However I’m not convinced by the article of the larger predictive weight being given to sea surface temperatures. Warmer sea surface temperatures many put more moisture in the local boundary layer – which can feed into storms – but you can’t do anything big without sufficient cold air that sticks around for the storm (whether warm or cold water temperatures). I applaud the attempt to keep looking for cause and effect, just think more work needs to be done. Like most, I tend to cheer NASA on when it tells me what I’m inclined to hear. I also give ’em the fish-eye when they do otherwise. This latest NASA performance gets my personal “smiley face”, of course, but NASA has a long way to go before earning “trust” in the realm of AGW. Moderator: It seems that everything I send you lately disappears into the spam filter (it apparently just ate another one – no “comment awaiting moderation” message popped up). Anything I should do to stop that from happening? Its all about the Lunar declinational tides in the atmosphere and the resonate cyclic patterns of their interactions over the 18.6 year Mn cycle. To not consider the main driver of the global circulation, with its resultant Rossby wave, and jet stream fluctuations leaves you with a limited forecast range, of less than 27.32 days or 13.6 days, the periods of the atmospheric tides. I’ve always been amazed that there is an animal called a chicken which everything tastes like. Now we have a phenomenon called global warming that alarmists claim everything looks like. It is not news that El Nino brings moisture and rain. Enough to make the Atacama desert bloom and turn sunny California into cloudy California. All this is caused by warm water from the Indo-Pacific Warm Pool that an El Nino wave carries across the Pacific. It splashes ashore in South America, spreads out north and south about 15 degrees, and warms the air. Warm air rises, stops the trade winds, and creates cloudiness and rain. Westerly winds then carry it across the continent and surprise – the Southern tier gets it too. What is new in their observations is not the El Nino effect but the role of the North Atlantic Oscillation in regulating temperature of the east coast. I’m a meteorologist and I read the article with interest since I’m always interested in seeing if we can predict mega snowstorms far out in the future. … However I’m not convinced by the article of the larger predictive weight being given to sea surface temperatures. How can you not be convinced? The modelers are sure that the models confirm that the modelers have pinpointed the exact cause by using the models. All of these “A cause other than AGW is found to explain an extreme event” threads are based on a strawman. Nobody claims that AGW alone will be the cause of an extreme precipitation event, extreme heat event, etc. Clearly, extremes always involve extreme weather situations to set them up. The question is rather whether AGW “loads the dice” so-to-speak so that these extreme events occur more often, e.g., the one-in-100-year floods start happening once every 20 years. And, I am not claiming that in this particular case it has been demonstrated that AGW did make such a snowmageddon event more likely. But showing particular causes for this particular extreme event is not going to provide evidence that AGW did not make it more likely. It alone provides no evidence in either direction on that question. “The increased rain occurs when warm sea surface temperatures heat the surrounding air, which then rises and condenses into rain clouds.” ??? Or does the CO2 dissolved in the water exert its magical powers here as well and trap heat or – oh, stuff it, that argument won’t wash – “the warm sea surface temperatures heat the surrounding air” ? Now hang on a minute – is CO2 the main climate driver or not – sounds like these guys are sceptics ? Good heavens! And you’re telling me these people actually get paid for this ‘work’? I used to have a teacher when confronted with such matterial would describe it as ‘waffle’. I’m sure very few of the very sensible readers of WUWT smoke cigarettes but many will have seen a cigarette burning as it sits in an ashtray in a ‘still’ room. Close to the tip, a continous column of smoke rises vertically…as the column gets longer it begins to waver until it reaches a certain point where it twists, curls, falls, coils, writhes, wreaths and ultimately dissipates and disperses into a generalized fog. Any efforts the modellers make to predict the behaviour of such a process would be laughable and only end in failure. Yet squillions of dollars are currently being wasted on trying to use super computers to predict weather and climate which although taking place on a slower and grander scale is ultimately as chaotic. There was a time, before the power of Computing was fully understood, when it was naively believed that if you had a big enough, fast enough machine you could use it to successfully project these processes into the future. I think that era is past. Computer modelling certainly has an important and valuable role in processes and situations where constant/stable/measurable/repeatable processes are at work. Weather is not one of these. Cue the Turbocharged Weather Pattern… Get ready, Brenda. http://www.ncdc.noaa.gov/oa/climate/severeweather/tornadoes.html ) and that ACE was at a 30 year low (Maue, R. N. (2011), Recent historically low global tropical cyclone activity, Geophys. Res. Lett., 38, LXXXXX, doi:10.1029/2011GL047711. ), his first response was “junk science” and then demanded to know how I could explain the recent tornadoes in the south. Attribution of particular events to AGW is alive and well and being taught in university classrooms. Check out these videos from: http://iceagenow.info/2012/02/villages-buried-4-5-meters-snow-video/ if you want to see some more global warming snowmageddon. Hope they can resque these people!!! Beg all you want, but at least get the concept correct. It is not Leif’s or anyone else’s responsibility to prove how the sun DID NOT cause something. It is up to the person claiming a cause to show the mechanism between cause and effect. You have cold. The Sun has low SSNs. What’s next? The idea that AGW causes snow is so obtuse that it has resulted in the adherents being seeing as clowns by the general public. Snowmageddon? Yeah, phooey. The only thing of great magnitude, was the lack of preparedness for real winter. Just ask anyone who lives in the SE lee of the Great Lakes – Cleveland or Buffalo, fer instance. There are many people that may still think the statement has some validity. It doesn’t. Once in your head, you can’t flush it. Too bad. You can suppress it, though. Please do. Thanks. The question is rather whether AGW “loads the dice” so-to-speak so that these extreme events occur more often, e.g., the one-in-100-year floods start happening once every 20 years. AGW science tells us a positive NAO/AO is more likely to dominate. This would suggest less storms like Snowmaggedon in a CO2 controlled world. More study into the northern polar vortex would be money better spent. There is a lot of research for the past 3 decades doing exactly that, primarily aimed at the low solar/jet stream link. The trouble is most people (including you?) are not aware of this research. Which paraphrases exactly what I said at the time and all the time since. it’s pretty darn obvious. And Al Gore said that the amount of snow, has as a contributing factor, sea surface temperature. And that therefore more snow is not a disproof of global warming. I a pretty sure that climate skeptic land missed out on the subtleties of the logic in “not a disproof”. If memory serves, based on this elementary misunderstading of basic logic, one of the Cato institute’s eccentric economists wrote an opinion piece claiming that Al Gore was a liar because Al claims that higher SSTs can produce more snow. The economist in question then got confused about the distinction between troposphere and stratosphere. The Cato institute needs better economists I think. Wow! An admission from Latitude that the computer games got the right answer. Progress is being made. They were vague about when and where. Most likely a generation from now when we have clocked up another 2C. I am certain they did not mean now this minute. They also said if the gulf stream slows down Europe could get a lot colder, but at the moment they have gone off that idea. So sorry, if you want make up a story to discredit someone, you should know that there are people out there who notice when you misrepresent what was actually claimed. Any efforts the modellers make to predict the behaviour of such a process would be laughable and only end in failure. No. While you can’t reproduce the exact curls of the smoke you don’t have to, to get understanding. Computer modeling of turbulent processes combined with experiments is a lot more powerful as a way of obtaining understanding than experiments alone, since the modeling fills in the gaps not accessible to experiments. So you acknowledge that IPCC consensus climate scientists are being intentionally vague to avoid being called on their bluff. Thanks. You are learning. Is there anything that can disprove Global Warming? The IPCC consensus climate scientists always have a study that they can show that exactly explains what just happened. If the opposite happens, no problemo, we have another study for that, look here. the warmists do have a neat explanation to the casual observer. at best we might see some warmist considerations for cold weather – at the expense of ‘green energy’ projects. obvious to me is the necessary suspension of efforts to reduce CO2 emissions on electricity grids. there is no energy crisis, other than that created erroneously. coal ? okay, maybe it’s a finite resource, oil ? renewable when I last looked. gas ? more ‘renewable’ than oil ? nuclear ? nice to see Obama rubber- stamping new nuclear power stations. electro-magnetic ? the elephant in the room ? canada has a cure for cold conditions, aka nuclear energy. That’s complete hogwash. What gap that is not accessible is filled in by a weather model? The research indicates that warmer ocean temperatures are closely associated with events such as the “Snowmaggedon” as the energy and moisture to move all that water must come from somewhere. Ocean heat content is much higher than 30+ years ago. Climate models show ocean heat content will continue to rise with increasing CO2. Snowmaggedon is consistent with AGW…not proof, just consistency of expected effects. Snowmaggedon is consistent with AGW…not proof, just consistency of expected effects. Whoah, Is there more them one of you posting on your account?! how do you prepare for snowmageddon ? er, domestically, stockpile food. buy produce in summer, enough for 6 months, preserve and store it. there are such things as solar cookers for those who insist on going solar to cut emissions. I’d recommend a Parvati arrangement. there’s no reason this design couldn’t become multifunctional. My point is simply that the fact that an extreme event was due to certain extreme weather patterns is obvious and the identification of this pattern alone does not provide evidence either way on whether such extremes are made more likely or more severe by AGW. Do you have a link discussing the evidence regarding the trend toward more positive NAO/AO with AGW? This, together with better understanding of what types of patterns set up the Snowmageddons such as this paper discusses, would potentially provide some real clues as to whether they become more likely or less likely under AGW. I am not strongly wedded either way on the question of whether such events will become more or less likely under AGW since there are competing factors in both directions (e.g., generally warming favoring less snow vs increase in moisture and extreme precipitation events favoring more snow, as well as any general changes in weather patterns). My point is simply that an extreme event is always associated with an extreme weather pattern and an identification of the weather pattern that caused the extreme event does not in and of itself say anything regarding whether AGW made such an extreme event more likely or more severe. The links between solar activity and climate remain controversial, but headway is being made to oppose the IPCC rhetoric and dogma. Similarly the planetary links to solar and PDO drivers are also making headway as more research comes to hand. Nicola Scafetta has already proposed a Harmonic Climate Model which deals with the level 3 oscillations. Nicola is very aware of the higher levels that need to be fully incorporated, which perhaps may happen in print in the not too distant future. Oh, wait. Those are your words – not mine! I’m not in the Computational Fluid Dynamics business these days, and I don’t know of any attempts to model the laminar/turbulent flow of cigarette smoke, but I assure you millions of computer hours have been spent looking at related stuff. It’s really nice to know if things like control surfaces of supersonic aircraft will work before the test pilot finds out. Here’s an impressive computer generated image of turbulent flow over a flat plate. Follow the links to the image and video galleries for more numerical model simulations as well as physical models (e.g. wind tunnel) and detailed observations of physical events. Also, take a look at http://www.stanford.edu/class/me469b/handouts/turbulence.pdf – it should give you a good laugh. Of course these events have been going on forever; storms, drought, floods etc. So how convenient that they all are signs of global warming, this from talking heads who have no idea why the storm happened. What was it in ’79 (then of course it was the coming ice age), 56′, ’45, ’34 and on and on? By the way, 2010 was no warmer than usual over the past ten years. why didn’t it happen in the ’90s when we were burning up? So Hansen norLazy Teenager hasn’t the foggiest idea what temps are going to be like in a generation. Certainly no trend is evident. As soon as I started reading this my thoughts jumped to “North Atlantic Oscillation”; I just wondered why it was taking them so long to get around to it. I was doing some reading on the NOA today and found that the Wikipedia entry was not too bad. http://www.cbc.ca/video/#/Radio/1447825254/ID=2194749707 on CBC radio (a local interviewer, interestingly enough). But if you listen to the clip, note the two references to “climate change” (or was it “global warming”? ), neither of which is ever taken up again. Since the CBC seems to feel obliged to push the AGW message at every opportunity, I was not really surprised, but I was still disappointed. The research indicates that warmer ocean temperatures are closely associated with events such as …“______________________. Just fill in the blank. With anything. “Ocean heat content is much higher than 30+ years ago. Data sufficient to support that assertion do not exist. Such observations of ocean heat content as we have contradict this aspect of climate model output. CO2 has continued to rise, but the heat content of the ocean that we are able to measure has not continued to rise. Even over the period during which it was rising most recently, it was not rising as fast as the models … uh … “predicted”. Of course it is. So is everything else. That is because AGW is not a scientific proposition. It is not falsifyable. Expected effects which include: hot temperatures, cold temperatures, rising temperatures, falling temperatures, droughts, floods, decline in snow fall, rise in snowfall, more El Ninos, fewer El Ninos, more La Ninas, fewer La Ninas, melting glaciers, growing glaciers, etc, etc, etc. Speaking of predictions … chief model worshipper James Hansen was predicting (on the basis of his AGW model making knowledge) a strong El Nino last year. That being year two of the current double dip La Nina … but it’s all consistent with AGW, so no worries. The term “model” has become a real put-off. I basically stop reading as soon as I see that term for the third or fourth time in an article. All sorts of things enter my mind when I see that term, like glueing plastic parts together to make a little airplane or racing car. It’s fun but not to be taken seriously. Its cold here in Japan- apparently a bit unseasonly cold so that some vegetable harvests have suffered frost- to me it seems as cold as last year when we have snow or rain and more cold than normal in sunny days (ice and snow is present in small patch five days+ after the last snow). Metreologist blame the Arctic and don’t try to push anything more than that. It appears very clear that a neg AO corresponds with increased snow activity in the NH. The last 3 years have been an eye opener for some. Even the past two weeks provide a perfect example of the phenomenon. There is building evidence that solar UV changes have a marked effect on the AO/NAO position. The models that incorporate increasing positive AO occurrences due to perceived CO2 influence obviously need to be scrapped. The term “model” has become a real put-off. It is not the term that should put you off. There is nothing wrong with using models. The problem is with how people use them, and that generally stems from how they view their models. When you start seeing people refer to their model outputs as “data”, or when you see them refer to their models “showing” or “demonstrating” or “confirming” some assertion of theirs – particularly when that assertion itself arises from the assumptions and logic embodied in the model – then run for the hills. Those people view their models as objective reality, rather than as a distillation of their own incomplete and flawed understanding of that reality. Model results are not “data”. Models do not “confirm”. Models are confirmed – by data. Or invalidated by data. Models are hypotheses. Perhaps you could enlighten us as to your point. It is totally elusive at present. Moreover it would be beneficial if you conveyed to us that you have a basic knowledge in relation to atmospheric science necessary to understand some of the solar/climate research taking place over several decades. Instead of hitching your wagon to Leif’s bogie, can I suggest you do some research of your own. It was -16C here in central England last night. I have searched back through the February daily data to 1878 and the nearest previous minimum was -13.6 in 1947. The maximum that day was 0C. Yesterday it was 2C so there was a fall of 18C. Compare that to 1947 when there was a fall of 13.6C. Why hasn’t the increase in CO2 since then reduced the difference? In fact we are loosing more heat by 4.4C. The next little ice age is beginning! Ric Werme…the example of modelling turbulence around a fixed wing or areodynamic shape is exactly the kind of modelling that is useful and feasible…the main reason being that for many years data was gathered from actual/practical wind tunnel tests. Atmospheric modelling has too many variables to offer anything other than a ‘simulation’ of one possible outcome. The actual outcome will always be beyond the reach of even the fastest computer. Lazy Teenager, R Gates and others after a few rampant solar cycles the oceans had taken on extra heat. The reaction is a negative feed back dumping heat, many even now are suffering many feet of white cold. The warm waters melted some arctic ice also dumping heat, our chaotic heat pump has thermostats, time lagged they do tend to overshoot before correction. It may get even colder even as the oceans cool under a sleepy sun. We would be cooked if our climate was not controlled by negative feed backs, there are no positive ones, the only real heat source is the sun. Anything that mankind can do to our planet is overwhelmed by the negative feed backs, AGW is impossible. Snow = Snow, however you put it NASA. Donkeyfritters. In the mid-Atlantic states, 2010’s winter precip was actually no greater than avg. But it all occurred as snow. So what was unusual wasn’t the amount of precip, but the presence of unusually cold air. Gulf of Mexico water was actually cooler than avg when the storms occurred. Please get these simple facts straight before posting. 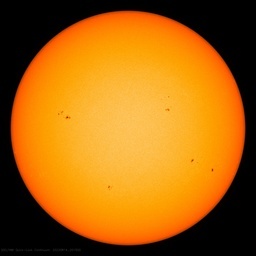 Sunspots influence low-level clouds which then influence climate. A wider lower solar cycle can have the same influence on climate as a narrow high one. The sunspot time-integral (properly reduced by the energy radiated from the planet) exploits this. Google ‘sunspot “time integral”‘ and follow the links to find an analysis that resulted in a simple equation that calculates average global temperatures since 1895 with 88% accuracy and accurately (std dev less than 0.1C) predicts temperatures since 1990. The research indicates that warmer ocean temperatures are closely associated with events such as the “Snowmaggedon” as the energy and moisture to move all that water must come from somewhere. Why, in that case did these so-called ‘scientists’ predict LESS snow? Gates, you and your fellow Greens are running a ‘heads we win, tails you lose’ scam, and well you know it. Too many people take certain parts of the climate statistics and use them for their own benefits. This year the winter in the U.S. seems to be milder so naturally some people will say that global warming is happening here. Other parts of the world seem to be having a devastating winter so what will they say about that? They will then use the term “climate change” and that the colder weather is also man’s fault. Statistics can be manipulated if you decide just to use the parts that benefit you the most. People need to look at the whole picture and make logical decisions. Joel, I was responding to what you wrote. Your contributions here are often very nuanced; these published academics offered no nuance at all in this discussion: AGW causes more and more intense storms. When challenged, they did not respond with “loaded dice” scenarios, they demanded an explanation for what else could have caused a specific tornado event if not AGW. As for your assertion about a well-established link, the empirical evidence shows no link at all. The “loaded dice” metaphor is plain and simple hand-waving. On the NOAA NAO page, http://www.cpc.ncep.noaa.gov/data/teledoc/nao.shtml, I thought I would find a prediction of the NAO for the next few weeks and months. It appears that, beyond about a week, they have no idea. Their predictions look like random musing and guesswork. They apparently have no idea what causes a negative or positive trend. Surprising that something so important to weather would still be such a mystery. As many as money can buy, in fact! The range simply represents the variability of the models according to different initial conditions or even different models treating physical effects in different ways. In other words, the range represents ignorance. And they assume that the average of ignorance is knowledge. But they don’t admit that in ways that allow people to understand, for fear of derisive laughter. Surely you know by now that you should report all temps in Degrees Kevin! Or have your observations Null-ified.